For Baselworld 2015, Omega has released a limited edition timepiece to mark the 45th anniversary of the safe return of the Apollo 13 crew on April 17, 1970. 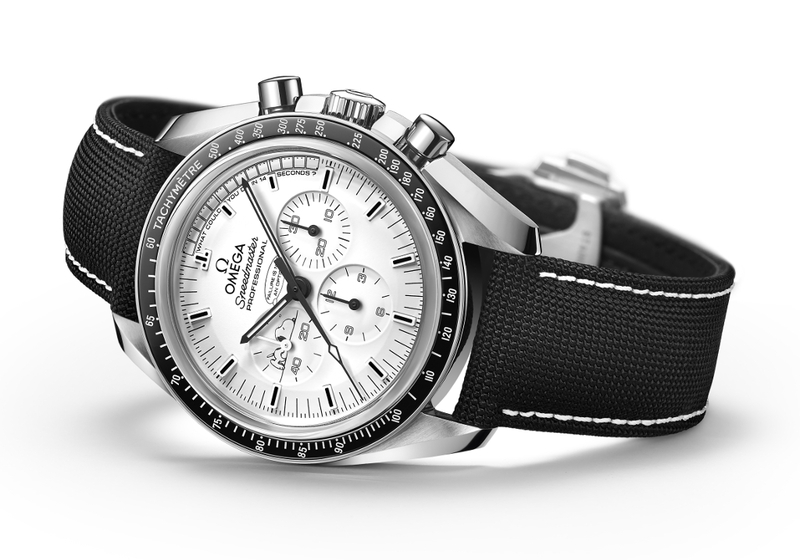 Introducing the Omega Speedmaster Apollo 13 Silver Snoopy Award. The OMEGA Speedmaster Apollo 13 Silver Snoopy Award pays homage to the unforgettable mission 45 years ago and celebrates the teamwork of the 3 man crew to return home safely. The dial of the Speedmaster Apollo 13 Silver Snoopy Award, inspired by the black and white comic strips printed in newspapers, is at once recognisable as the inverse of its legendary predecessor. Snoopy, the beloved dog from the Peanuts cartoon and a NASA mascot, decorates the dial and the caseback – a small tribute to the Silver Snoopy Award that OMEGA was presented with in 1970 in recognition of its contributions to the entire Apollo programme. Distinguishing this limited edition timepiece are the two inscriptions that decorate the dial. Fourteen small squares between zero and 14 seconds on the dial come together to form a long comic strip, with the words “What could you do in 14 seconds?” written underneath. 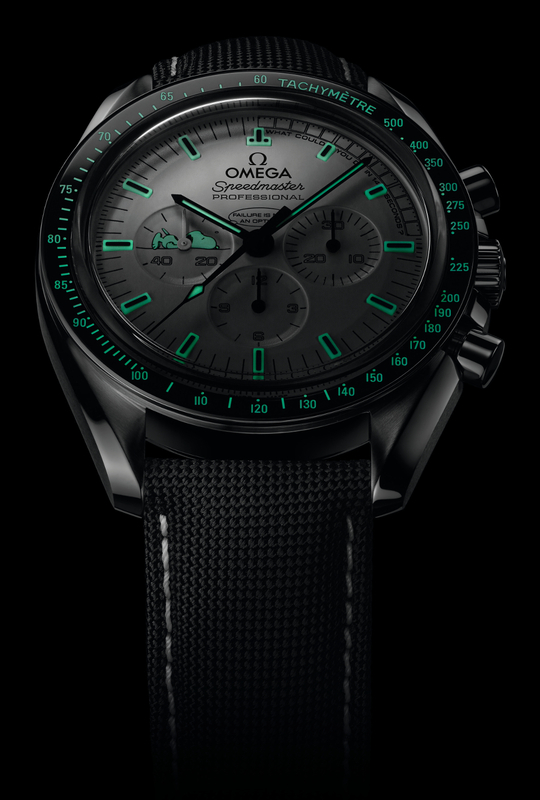 The question is a nod to the 14-second mid-course correction that the Apollo 13 astronauts timed with their on-board back-up timing device: the OMEGA Speedmaster. The watch features a polished black ceramic bezel, which features a Super-LumiNova tachymeter scale. Super-LumiNova is also found on the central hour, minute and chronograph seconds hands. The luminescent material was used to make the indexes and their glow is enhanced by the black varnish that fills the indexes’ top cavities. What the watch looks like when lumed up! 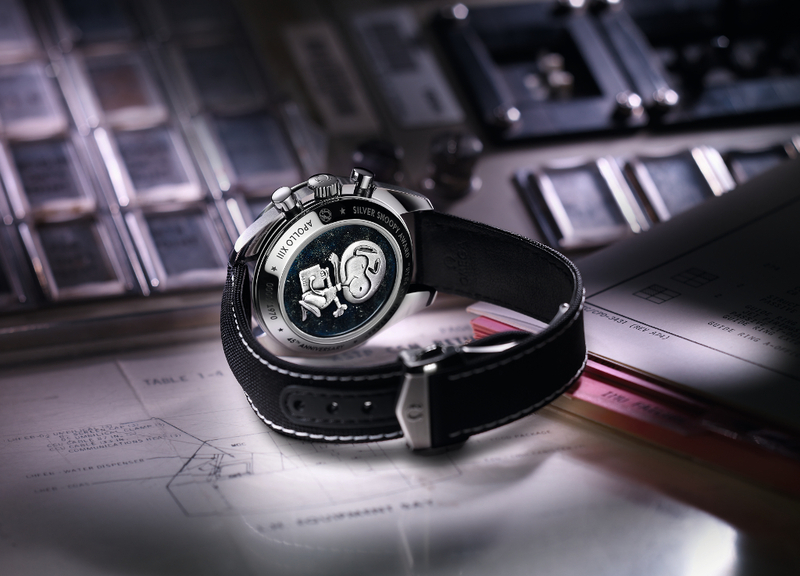 Among the most interesting and intriguing features of the timepiece is its alluring caseback. Protected by a scratch-resistant sapphire crystal is a 925 silver medallion that resembles the pin that accompanied the Silver Snoopy Award that OMEGA received in 1970. The silver Snoopy is mounted on a plate of the same material and is surrounded by dark blue enamel. Silver powder is sprinkled by hand over the enamel of each individual caseback, giving the impression that Snoopy is floating in space. “SILVER SNOOPY AWARD”, “EYES ON THE STARS”, “45TH ANNIVERSARY”, “0000/1970” and “APOLLO XIII” are engraved in the stainless steel caseback in black. The 42 mm stainless steel timepiece is presented on a black coated nylon fabric strap with white stitching and a foldover clasp. The Speedmaster Apollo 13 Silver Snoopy Award will be produced in an edition limited to 1,970 pieces. At its heart is the OMEGA calibre 1861, the same manual-winding chronograph movement that powered the legendary Moonwatch.